Readers often look past these first two verses of Matthew 4 in a hurry to read about the temptation of Jesus. However, these first two verses are important all by themselves. Jesus was led into the wilderness by God’s Spirit. He had just been baptized in the Jordan near Bethany. The “wilderness” that Jesus entered was the desert, as some translations accurately translate. I used to think wilderness meant trees and forests, because that is what I grew up to refer to as “wilderness.” But there is a HUGE different between the two, obviously. The Greek word used in the original written manuscript of Matthew is the word “eremos” which is used to refer to places that are abandoned, lonely, desolate, uninhabited, void of people or animals, without life or the ability to sustain life. Where does this remind you of? What words would you use to describe a desert? symbolic and prophetic – Jesus entered the wilderness like others that God had called and led into the wilderness: Abram, Joseph, Moses, David, Elijah, and John the Baptist. It seems God’s blessing is on those He calls into the wilderness. proving ground – the wilderness tested character, calling, and resilience. What difficult task or experience has been a proving ground in your life? mission preparation – Jesus’ time in the wilderness was preparing him for the trials he would face and subsequently call his followers to face. The number “40” throughout the Jewish and Christian sacred texts was a number synonymous with “preparation” and “transformation” in addition to “testing” and “trials.” Only difficulty can prepare us to face difficulty…with Christ, we never have to face it alone. trust and dependence on God – the wilderness experience teaches and trains us to depend on God to provide. The wilderness reveals our weaknesses and addictions. God offers to replace them by providing for us as was done for the Israelites who wandered in the wilderness for 40 years with Moses, or for Elijah in the wilderness for 40 days, as well as for John the Baptist and here Jesus. SO WHAT?! So what Lance? What does this have to do with my life? Exactly, what does the wilderness look like in your life right now? What feels like the wilderness in your life right now? The wilderness you are experiencing may be a proving ground or maybe its preparing you for something more. Either way, what provided Jesus with the resilience to make it through was his trust and dependence on God. Today, what/who might you need to trust God to take care of while you’re in the wilderness? So GO… May you grow deeper in your trust and dependence on God as you walk into the wilderness of your life. May God’s Spirit fill you up with resilience while you’re inside the proving grounds of life. And may God give you strength as He prepares you for the mission ahead…in the name of the Father, Son, and Holy Spirit. Amen. Q: What is the toughest part of night land navigation? A: The darkness makes a challenging task even more difficult. I attended Infantry BNCOC in July 1997. One of the tasks for graduation was individual night land navigation (LandNav), in which we each had to find three out of four points within three hours in the foothills of the Ozarks at Camp Robinson, AR. I found my points in the allotted time, turned in my “passport card” at the finish point for grading and waited with others in my class as the rest of our classmates drifted into the finish point. We knew anyone who didn’t make it before the three-hour cut-off would have to test again or be dropped from the course. There was one Sergeant who hadn’t checked in yet, which puzzled us all. 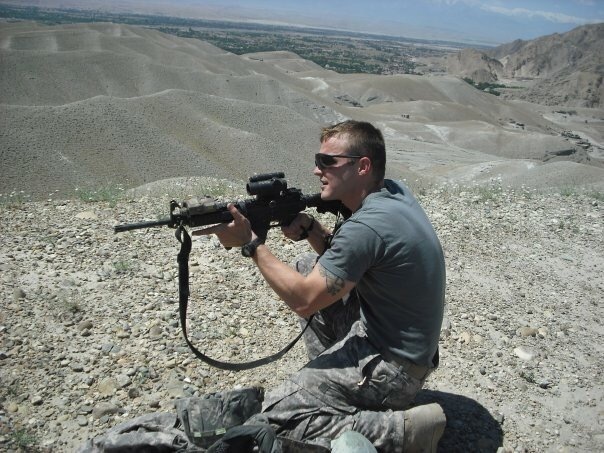 He was SGT Pelango and a very experienced NCO with a Combat Infantryman’s Badge, Expert Infantryman’s Badge, Ranger tab, and Ranger Scroll combat patch. He was still out there in the darkness. One by one, as our classmates rolled in – especially those who self-identified as having trouble with landnav – we started to seriously wonder where SGT Pelango was. Our LandNav-challenged classmates began to share stories about getting lost and fearing failure of the LandNav course. However, they said they were each found by Pelango. He re-oriented each person to their location and sent them on their way, at the expense of time he needed to pass the LandNav course himself. He was still out there in the darkness…finding lost Soldiers and pointing them in the right direction. About five minutes after the three-hour deadline passed, Pelango raced to the finish point. He found all of his points in the first hour, but didn’t go to the finish point because this meant he would have to stay in the finisher holding area. Instead, he stayed on the course to guide those lost in the dark. Pelango failed night LandNav due to missing the time requirement. He would have to retest. The next night he passed the night LandNav course in just over an hour. SGT Pelango helped those lost in the dark at his own cost. 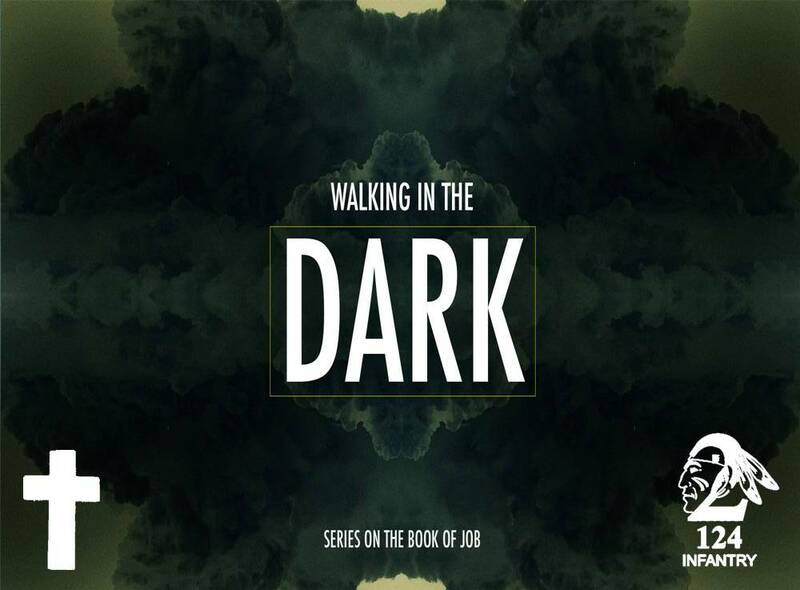 The Walking in the Dark series follows the book of Job (link) over three weeks. It acknowledges that we all “walk in the dark” at numerous times in our lives. I originally thought about calling the series “Finding God in the Dark” but was corrected by a fellow pastor that we don’t “find God” in the dark, rather it’s most accurate to realize that God has been with each of us all along…and walks with us into the dark places of life. The book of Job illustrates the truth of life: Bad things DO happen to good people…to all people; which is a result of the broken nature of our world. Humanity is the victim of itself. However, God is present with Job in his suffering. God displays this throughout scripture. SO WHAT? What does the book of Job have to do with me? Darkness is disorienting and harbors the unknown and unseeable. – We all lose our compass or our pace-count. – Our batteries burn out in our night vision goggles and flashlights. Job teaches us that God is with us as we walk in the dark. Although God remains silent for much of this story, God is present. Most of the struggles we face are best remedied by the company of others rather than their words. God is with us. God was with Job in his tragedy. God was with Christ in his passion. God walks with us in our darkness. It is interesting to realize that the Army knows that training in the dark actually makes us more effective, efficient, and expert Soldiers. What if we, as people of faith, recognized the same principle ~ walking in the dark is unavoidable yet also beneficial to our life as followers and disciples of Jesus Christ. WHAT NOW? What are we supposed to do now with this understanding? Reflect on what the present “darkness” in your life specifically looks like. How might this draw you closer to God instead of push you away? Realize this: as with Job, God is walking with you in your darkness. Just like the SGT Pelango illustration, through Christ, God walks with those of us lost in the dark at His own cost. 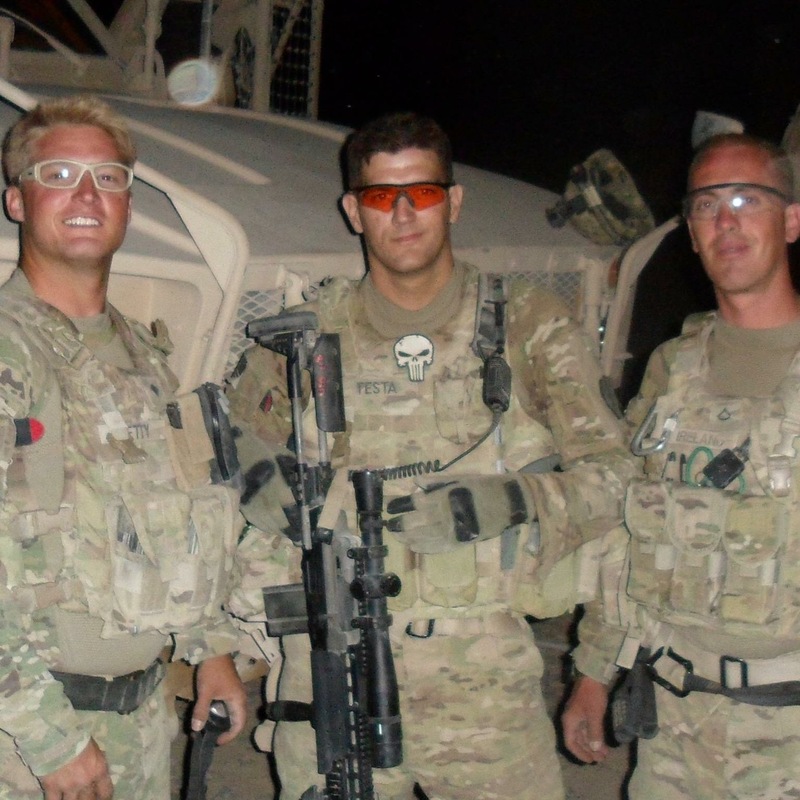 2 will not deploy with us, but these 2 still go with us. 2 lived their lives serving others. 2 went out of their way to help a stranger or make a new friend. 2 loved others and were loved by more than we know. 2 have finished the battle, but still fight with us. 2 are gone but still here. Thank you SGT Testa and SGT Landon for the Warriors you are the Warriors you’ve helped us to be. We’ll link-up again at the final rally point. SGT Testa and SGT Landon died in separate off-duty events during the seven days leading up to our official report date for deployment. A memorial ceremony for each Soldier was held at their respective units on Sunday, August 2, 2015. Sunday, “the first day” of the week, was initially observed by the first Christians as a reminder of resurrection. A declaration that death does not have the final word. Rather, the arc of the universe bends toward life. I believe we will meet again. “Trouble no one about their religion; respect others in their view, and demand that they respect yours. “Love your life, perfect your life, beautify all things in your life. Seek to make your life long and its purpose in the service of your people. “Prepare a noble death song for the day when you go over the great divide. “Always give a word or a sign of salute when meeting or passing a friend, even a stranger, when in a lonely place. “Show respect to all people and bow to none. “When you arise in the morning, give thanks for the food and for the joy of living. If you see no reason for giving thanks, the fault lies only in yourself. Abuse no one and nothing, for abuse turns the wise ones to fools and robs the spirit of its vision. “When it comes your time to die, be not like those whose hearts are filled with fear of death, so that when their time comes they weep and pray for a little more time to live their lives over again in a different way.